Crop protection – worthwhile, but not exciting? Crop protection has been on my mind a lot for the past six years or so. My professional interest lies in protecting crop plants from insect pests, but there are other facets to crop protection too, as diseases and weeds also affect plants and their potential yield. The interest in this topic among the general public and funding bodies is not great. Discussing insect pests is a bit like going to a party and talking about the latest illness you had. It makes people look uncomfortable, like you‘ve shared too much detail of some ghastly bodily function – unless they‘ve previously had a problem with a particular pest and then it‘s like a meeting of two people suffering from back pain, the stories flow, solutions are discussed and the importance of the problem acknowledged. 870 million people still go hungry in the world every day and the world population is expected to grow from 7 billion to 9 billion by 2050, but global agricultural growth is slowing down (OECD-FAO). Consumption patterns are changing with more people wanting to choose a diet including meat, which requires more energy to produce than a vegetarian diet. All this leads to the conclusion that we will need to produce more food – preferably without damaging more of our natural habitats. That is why it is equally important to safeguard crop yields as it is to increase the yield potential of plants. Insect pests, weeds and diseases are responsible for a large proportion of yield losses worldwide and affect most crops to some extent. Crops have been bred for increased yield, but a number of studies have reported benefits to pests and pathogens of higher yielding crop varieties, as these opportunists benefit from the higher nutritional quality of the plant tissues. A review on crop losses to pests (Oerke, 2006) reported potential yield losses ranging between 50% in wheat to 80% in cotton. Actual losses are somewhat lower than these figures, ranging from 23-40% in six major crops in 2001-2003. This means that there is less food to consume from an area of land, which can lead to higher food prices. The availability of crop protection measures varies widely between regions and despite the increase in pesticide use actual crop losses have not decreased in the past 40 years. 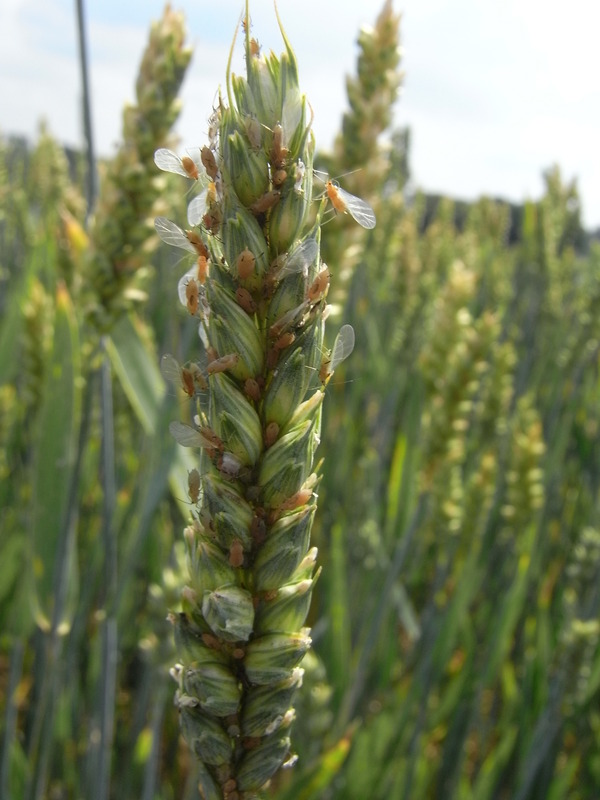 In December 2012 the Association of Applied Biologists and the National Farmers Union in the UK sent an open letter to the Minister of State for Agriculture and Food, emphasizing the need for research and development of alternative approaches to crop protection and knowledge transfer of those to growers and agronomists. Food security has been a big issue for the past couple of years and will be for the foreseeable future. We need to produce more food and it needs to be more evenly distributed. We need to reduce food waste, increase yields and to safeguard the yield potential of the crops we plant. For protecting our crops there are no silver bullets, research takes time, especially when it needs to be tested in field conditions. Once a resistance mechanism is identified, developing it, or breeding resistance into existing high yielding crop varieties is a time consuming process. Insects and other pests are incredibly variable and in many instances we don‘t even know their basic biology well enough. We need more people, time and resources to study this in order to combat these pests. The reason they are able to proliferate to such an extent is that we have created artificial habitats for them, vast expanses of food source, and it is no wonder they react like children in a sweetshop, eat all you can, no restraint, no worry. The fact is that going into the future we are likely to need more food, not less, and in order to achieve optimum crop yields we need to have robust crop protection. For this we need research. Last year I had a research proposal rejected and when we sought feedback, one of the comments was that the proposed research was „worthwhile, but not exciting“. Now, I am not saying the project should have been funded if there were other better applications. My feeling, however, is that now is maybe not the time to be only exciting – we need results and they will take a while to develop. Protecting your crops is like buying insurance, no one wants to spend money that they don‘t have to spend, but in the end when we land on rough times, having a roof over your head or being able to feed your children is more important than taking them to a theme park. Or is it not? This entry was posted in Agriculture, Environment and tagged Gia Aradottir by gia. Bookmark the permalink.